More than a million people thought they were going to die. One story in the Washington Post described a family’s attempt to protect themselves with yard equipment after they saw the alert. “My 10-year-old was kind of melting, sitting at my feet rocking, saying, ‘Mom, are we going to die today? Why won’t you answer me?’ and I wanted to answer him, but I couldn’t. It felt like my worst mom moment,” Hawaii resident Tricia Padilla said. But in the 1960s, the fear of a nuclear strike wasn’t prompted by an alert on a smartphone — it was a lingering effect after the Cuban Missile Crisis that spanned the length of the Cold War between the U.S. and Russia. And Cincinnati was prepared for a crisis. “Civil defense” as a concept boomed in the U.S. following the world wars, particularly focused on the threat of aerial attacks and bombs. The video above features TV newscaster Chet Huntley who describes — dramatically — how to best protect oneself from a nuclear attack: cover your face, stay indoors, close blinds and doors, barricade in a basement or cellar and — somehow — remain calm. “Go without panic” to “your shelters,” the video prompts. In the 1960s, Cincinnati converted its subway tunnels into a civil defense shelter. WCPO’s archives have footage of the shelters; they contained barrels of drinking water and equipment thought to prevent exposure to radiation. In 1971, emergency drills looked more like the mass shooter or tornado drills that are still common today. 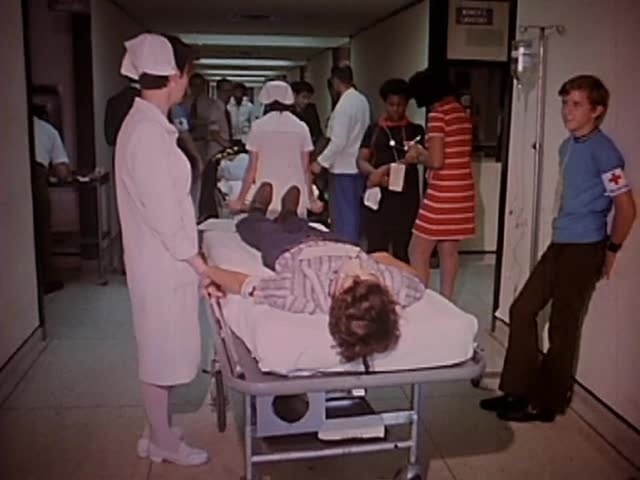 In Oct. 1971 footage from Christ Hospital’s annual emergency drill, kids served as patients while doctors and first responders reacted to an emergency situation. In the case of the video below, participants played out a scenario in which a tornado hit part of the hospital. Now, remnants of plans and drills like these are typically called “emergency preparedness,” as the the mobilized “defense” language has been largely abandoned in the U.S.
FEMA emerged in 1979 and took the helm on emergency response programs. Ironically, Hawaii is the only U.S. state to keep the triangular civil defense symbol on its emergency management logo .